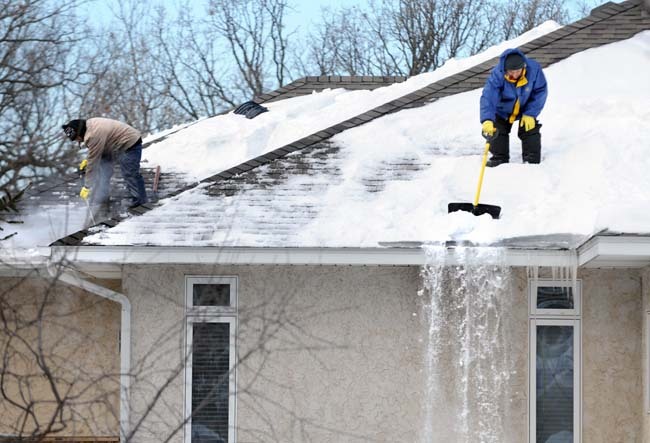 It is an unfortunate fact that most people are not willing to do typical roof maintenance in order to ensure that they do not have ice dam issues in the winter. This means that a quality roof installer needs to go to extra lengths in order to protect the homeowner from this likelihood. It is a common issue that looks like it is just going to get worse as time goes on and our weather continues to become more and more unpredictable. Whether you attribute it to global warming or some other factor is the topic of a different conversation, for now lets talk further about what to do to stop your house from leaking. We have already determined that it is unlikely you are going to get up on the roof and shovel off the ridiculous amount of snow that has accumulated up there. I can not blame you for that, it is dangerous to do so and even though that is the best route to take you should always call a professional to take care of this for you. Yes, that means it may cost you a little extra money, However, you will not be risking your own life and you will not have a neighborhood kid up there destroying your shingles with a hammer as they try to chip away all that ice. Never throw regular rock salt up there either as it will damage the shingles, if you want to melt some of that ice off they have specific products that will safely do so or you can use some calcium chloride. They even have little pucks that slowly release the calcium chloride and all you have to do is toss them on to the roof from the ground. A roof rake is a great tool that typically comes with an extension pole so that you can clear the roof off safely from the ground. You should always use this device to at least clear the snow away from the eaves, or edges of the roof. This way the melting snow does not freeze up in the gutters, blocking all that water and causing it to flow back into your house. In certain areas that are hard to get to, it may not even be possible to rake or “salt” them. Often times when there is a dead valley in which water or snow tend to accumulate, or the roof slopes into and terminates at a wall, you may constantly find yourself encountering issues. Even if you are not currently, it is common for the stagnant water to erode the siding or any exposed wood over time. Many homes are simply poorly designed and there is no one to blame for that except the architect. In these type of areas it is recommended to at least install some heat tape to assist the proper flow of water. The more ice that accumulates the more likely there is going to be some serious damage. You have seen what ice can do to concrete, do you honestly think your roof will be able to resist this destructive force forever? Always ask your roofing contractor how they deal with problematic and high traffic areas. City code requires at least 2 feet of ice guard from the eave and any inner wall. In our experience, this is just not enough to properly protect a home. A quality install will include ice guard at least 6 feet from the eve, underneath all valleys, and around all penetrations. All unheated areas, such as a porch, should be completely covered and this should also be the case for any low slope areas as well. In the areas that terminate against a wall, it is all about the flashing. Everyone seems to have an opinion on how to properly address these areas, but in our experience it is best to run the ice guard up the wall before install the flashing. Often times, this means that the siding has to be removed and it is a pain. But it is much better to get it over upfront instead of coming back the following winter or spring because water is finding its way into your customers home, working its way through the siding.